The Dump Truck Friction Powered toy is ready for rocks and rolling! 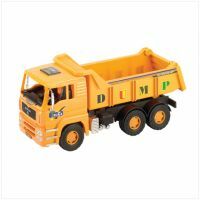 This bright yellow dump truck is ready to take on any load your child can dish out. And if that were not enough, a few rolls of the wheels sends this truck moving down the road! So when it is time for tough jobs, bring out this friction powered dump truck. Ages 3+.